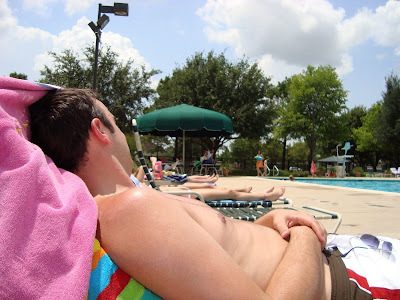 Just wanted to say "hi" while sitting poolside. :oP I hope this is making our family and friends want to come visit us here in H-town! 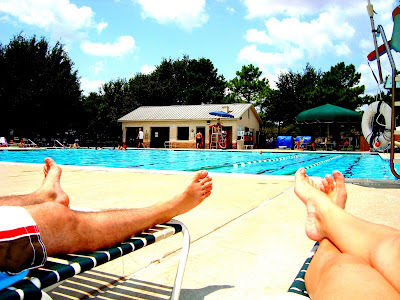 We have already been to three out of the eight pools in our master plan community. Still have a few more to visit to reach my goal of going to them all. Ok, I can't lie. It was beautiful this morning but shortly after our visit to the pool it stormed and it stormed HARD! My Snapfish photo book arrived this week and I absolutely love it. It's a perfect way to display all our many photo's from Italy in a creative way without spending a ton of time or money. Don't get me wrong, it still took time and money but not nearly what it would have if I had scrapped booked all of this! I was very pleased with how it turned out. Plus, Pioneer Woman had a photo contest going on at her website and she had an offer for 50% off all orders from Snapfish. So I jumped on that. I also really like Shutterfly and they usually always have some kind of discount or promotion going on. I used Shutterfly when I made a photo book of our honeymoon. I know this has been a very random post but we had another random weekend. While we were out and about we stopped by Bassett Furniture to see if they had any deals in their clearance room. We scored big time! 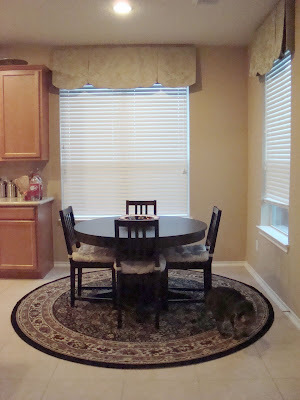 After a very long search for the perfect round rug for our eat in kitchen, we finally found it. It's the perfect size, shape and color! It's so comfortable on my feet too. I haven't been able to stop staring at it since we got it. It really anchors the table and adds a lot to the room. This room is one step closer to being fully furnished. Next step, new chairs. :) This was our anniversary gift to each other. I like to do a group gift for our anniversaries, and ours is coming up!